Passengers using Heathrow's new Terminal 2 (T2) have been warned to expect early teething problems. 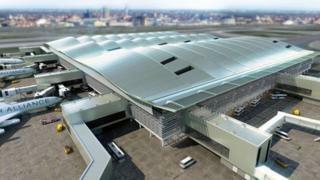 The £2.5bn terminal, which will be named after the Queen, is due to open on 4 June. Heathrow bosses said the challenges of opening the new building should not be underestimated. The airport's development director, John Holland-Kaye, said: "The chance of a completely smooth opening for any airport terminal in the world is low. "We can never assume we can have a perfect opening." T2 will be home to 26 airlines and up to 20 million passengers are expected to use it each year. The terminal will be opened in phases, with 10% of its capacity in use on the opening day. However, by November all airlines should be flying from the building. T2 operations director Brian Woodhead added that the phased opening would be useful "if we suffer teething problems". The Association of British Travel Agents (ABTA) said research had shown "a trouble free and pleasant airport experience" was important to UK holidaymakers. An ABTA representative said: "Teething problems can often be an issue when opening a new terminal but it is essential that Heathrow does everything possible to minimise any potential disruption to passengers when Terminal 2 opens in June."